ISLANDIA, NY--(Marketwire - January 21, 2011) - Jump into the excitement of NHL hockey and cheer on the New York Islanders as they step out against the Buffalo Sabres in league action Sunday, Jan. 23, 2011 at Long Island's Nassau Coliseum. Slated to meet three times in just 8 days, league rivalry will keep fire on the ice as the Islanders work to stay ahead of the favored Sabres and also play host to the Washington Capitals. By booking into nearby hotels in Ronkonkoma, NY there's still time to get away for hockey and family fun as the Islanders move into this busy schedule of Eastern Conference action. Sunday's clash with the Sabres is sure to be an exciting one. They set the pace with a 5-3 win against the Sabres last Saturday. However, they will need to regain momentum and rebound from their latest lost to the Devils on Monday. Only one game stands between them and the Sabres, as they host the Capitals on Thursday night. The team will then travel to Buffalo on Friday for a second league game against the Sabres before returning to Long Island for their final clash set for 1 p.m., Sunday, Jan. 23. Admission for Islander Hockey at Nassau Coliseum is $43.60 and tickets may be purchased at www.ticketmaster.com. Upscale Ronkonkoma hotels such as the Islandia Marriott Long Island welcome hockey fans with affordable and stylish accommodations and join in the enthusiasm of supporting the local team by offering accommodating services such as complimentary airport shuttle to and from Long Island MacArthur Airport. Well-appointed guest rooms and exquisite décor throughout the hotel property are only a few of the amenities that make the Islandia Marriott Long Island hotel a distinctive choice among ISP Airport hotels. 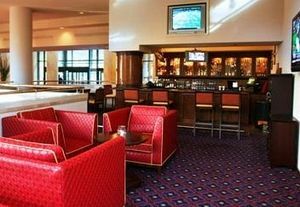 Socializing before and after the game will be easy while enjoying the hotel's friendly atmosphere and beautiful Atrium, where the Atrium Bar provides a relaxed atmosphere for visiting with friends, family and fellow fans. And, with accommodations at one of the most sophisticated hotels near ISP, guests can also enjoy other popular attractions including fabulous shopping opportunities at Tanger Outlet Mall and wine-tasting at North Fork Wineries. After enjoying exciting game day events, hockey fans can retrieve to spacious, well-appointed rooms at the Islandia Marriott Long Island hotel and relax with amenities that include luxury bedding packages, flat screen televisions with premium movie channels and movies on command. Rooms are also equipped with high-speed Internet access and Plug-In technology so guests can easily stay connected; and a coffee maker and tea service for a quick start to the morning. Conveniently located just off exit 58 of the Long Island Expressway, the Islandia Marriott Long Island Hotel is a newly renovated hotel property offering a variety of guest rooms and suites to accommodate the needs of both business and leisure travelers. This magnificent atrium hotel offers guests a warm and inviting atmosphere with on-site dining at the Bistro Five-Eight restaurant, a full-service business center, heated indoor pool, fitness center and complimentary parking. Whether you're traveling for business or pleasure, our Islandia, Long Island hotel is the perfect home away from home.